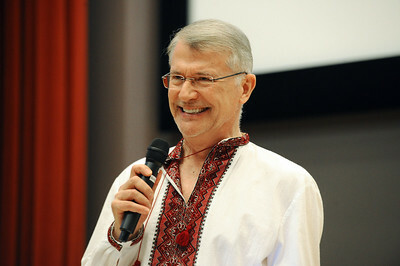 "Image of Ukraine (Образ України): Exploring Ukrainian Culture through Embroidery and Painting" highlights two traditional Ukrainian folk art forms - vyshyvka (Ukrainian embroidery) and petrykivka (a Ukrainian style of painting named after its city of origin). The exhibition was on display from August 22 to Dec. 8, 2017. 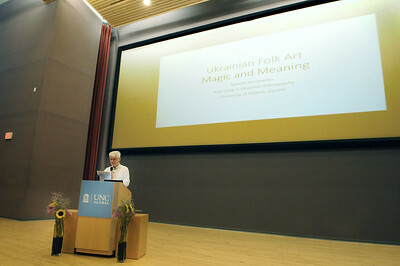 UNC Global hosted a reception featuring a keynote lecture "Ukrainian Folk Art: Magic and Meaning" by Natalie Kononenko, professor and Kule Chair in Ukrainian Ethnography in the Department of Modern Languages and Cultural Studies at the University of Alberta in Canada. 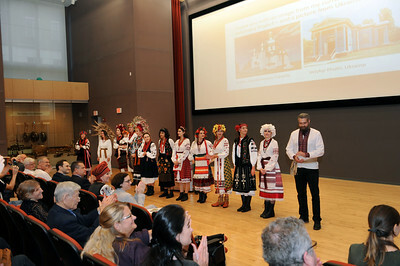 Kononenko's lecture considered why folk art and heritage are emotionally powerful for so many people. 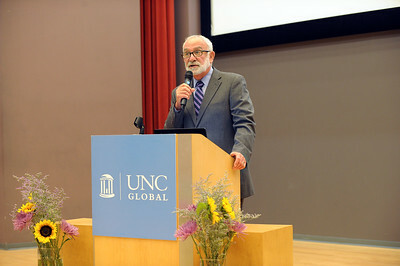 Donald J. Raleigh, Jay Richard Judson Distinguished Professor in the Department of History and director of the Center for Slavic, Eurasian and East European Studies, and Oleh Wolowyna, vice president of the Ukrainian Association of North Carolina, provided welcoming remarks. 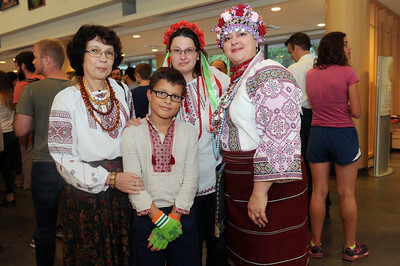 The lecture was followed by embroidered fashion demonstrations and Ukrainian food. All photos by Don Young. 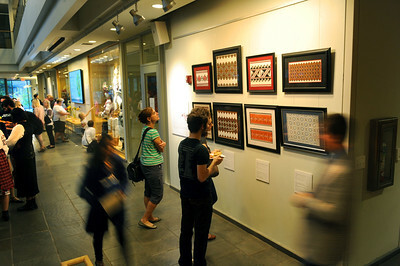 Attendees view framed embroidery pieces demonstrating regional variations on display at the "Image of Ukraine" exhibition. Photo by Donn Young. 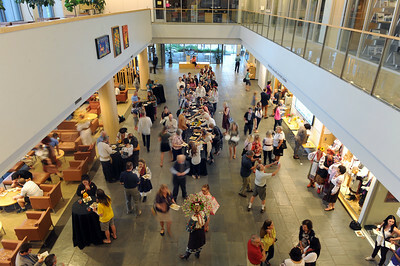 Attendees and participants enjoy the reception in the Florence and James Peacock Atrium of the FedEx Global Education Center. Photo by Donn Young. 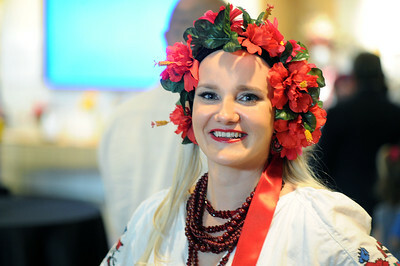 Maryna Kapustina, member of the Ukranian Association of North Carolina, and other attendees take a photo during the reception. Photo by Donn Young. 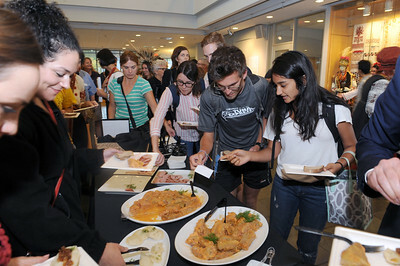 Attendees enjoy the reception featuring a variety of traditional Ukrainian food. Photo by Donn Young. 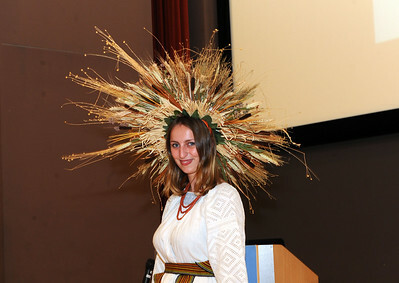 Model Lesia Zintchouk wears an elaborate Ukrainian headpiece, which she made herself. Photo by Donn Young. All participating models line up at the conclusion of the fashion demonstration, allowing the audience to view the embroidery collection. Photo by Donn Young. 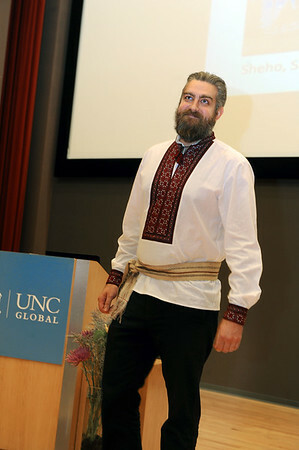 Trevor Erlacher, teaching assistant professor in the Department of History, demonstrates how vyshyvka is portrayed in men's clothing during the fashion demonstration of Ukrainian embroidery. Photo by Donn Young. A model showcases the key elements of her outfit during the fashion demonstration. Photo by Donn Young. Katerina Kermoschuk and her daughter model "vyshyvka." 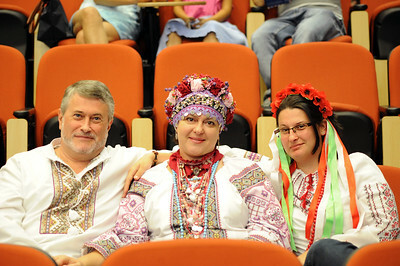 Lecturer Natalie Kononenko narrates the fashion demonstration of the Ukrainian style of clothing. Photo by Donn Young. 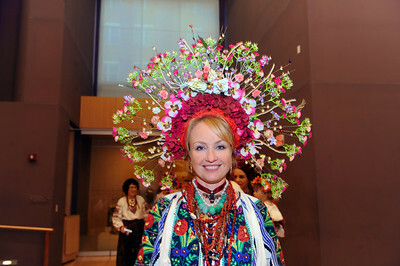 Anastasiia Kostenko, member of the Ukrainian Association of North Carolina, models an interpretation of a Ukrainian harvest wreath headpiece. Photo by Donn Young. Oleh Wolowyna, vice president of the Ukrainian Association of North Carolina, opens the reception with a few words about the association and its involvement with the exhibit. Photo by Donn Young. Attendees and participants await Natalie Kononenko's lecture, "Ukrainian Folk Art: Magic and Meaning." Photo by Donn Young. 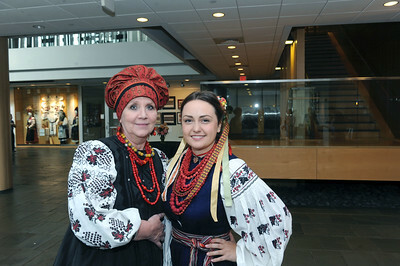 Olena Zintchouk, featured artist, and Iryna Voloshyna, a Ukrainian graduate student in the Department of American Studies, pose for a photo before the keynote lecture in the Nelson Mandela Auditorium. Photo by Donn Young. Exhibit producers and participants pose for a picture before the lecture. 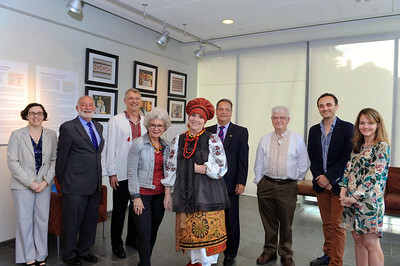 Left to Right: Katie Bowler Young, director of global relations; Ron Strauss, executive vice provost and chief international officer; Don Raleigh, director of the Center for Slavic, Eurasian and East European Studies; Natalie Kononenko, lecturer and Kule Chair in Ukrainian Ethnography in the Department of Modern Languages and Cultural Studies at the University of Alberta in Canada; Olena Zintchouk, featured Ukranian artist; Andriy Futey, president of the Ukranian Congress Committee of America; Oleh Wolowyna, vice president of the Ukrainian Association of North Carolina; Adnan Džuhmur, associate director of the Center for Slavic, Eurasian and East European Studies and Ingrid Smith, events and exhibitions manager for UNC Global. Photo by Donn Young. 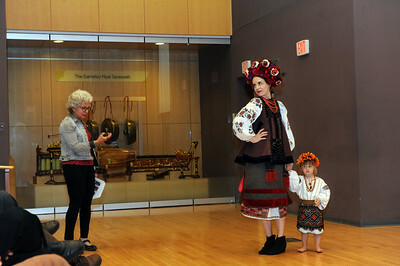 Oksana Koziaryk-Goldstein, a model for the fashion demonstration, is dressed in traditional Ukrainian clothing on loan from members of the Ukrainian Association of North Carolina. Photo by Donn Young. 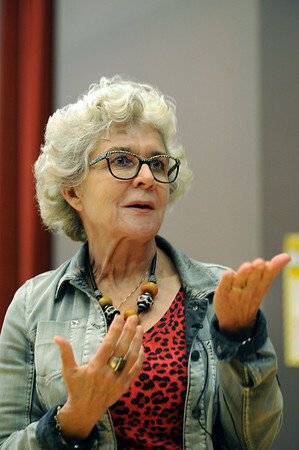 Natalie Kononenko delivers her lecture, delving into the emotional significance of folk art and heritage to people in Ukraine. Photo by Donn Young. Don Raleigh, director of the Center for Slavic, Eurasian and East European Studies, introduces keynote speaker, Natalie Kononenko. Photo by Donn Young. Ron Strauss, executive vice provost and chief international officer, provides welcoming remarks. Photo by Donn Young. 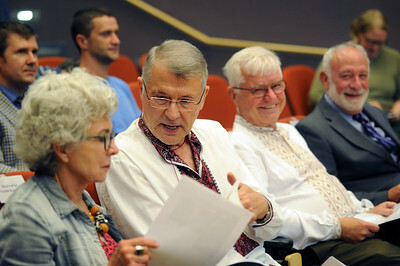 Keynote lecturer Natalie Kononenko, professor and Kule Chair in Ukrainian ethnography in the Department of Modern Languages and Cultural Studies at the University of Alberta in Canada, and Don Raleigh, Jay Richard Judson Distinguished Professor at UNC, speak before the lecture. Photo by Donn Young. 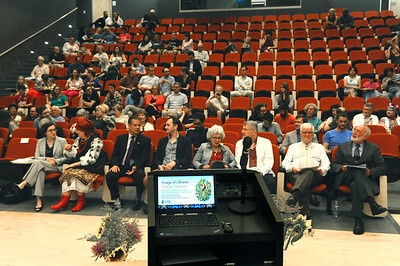 Attendees await the keynote lecture and fashion demonstration in the Nelson Mandela Auditorium. Photo by Donn Young. 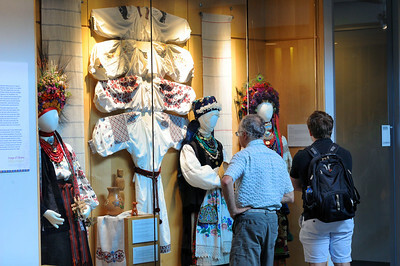 Opening reception attendees observe the display of traditional Ukrainian embroidery, or "vyshyvka," in the "Image of Ukraine" exhibition at the FedEx Global Education Center. Photo by Donn Young.